First German feature-length film capturing Anne Frank's life to be screened at major cinema showcase. The first German feature-length biopic on the Jewish teenage diarist Anne Frank who was murdered by the Nazis will premiere next month at the 66th Berlin film festival, organizers said Friday. "Das Tagebuch der Anne Frank" (The Diary of Anne Frank) will screen in the youth sidebar section Generation of the Berlinale, the first major cinema showcase of the year in Europe. "This film adaptation of the eponymous historical testimony that moved the world primarily depicts the period of time that Anne spent in her family's hiding place...in Amsterdam," the festival said in a statement. Anne Frank, who was born in Germany and moved to the Netherlands as a child, will be played by German actress Lea van Acken, who starred as the daughter of religiously fanatical Catholic parents in the drama "Stations of the Cross," which won best screenplay at the 2014 Berlin festival. Hans Steinbichler will direct the picture, co-starring Martina Gedeck ("The Lives of Others") and Ulrich Noethen ("Downfall") and produced with the permission of the Swiss-based Anne Frank Fund, which holds the rights to the diary. 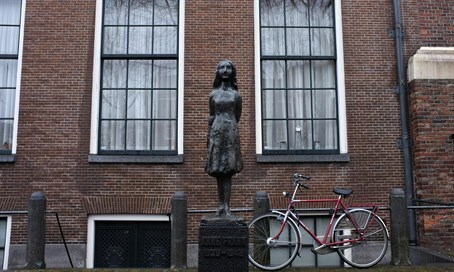 Frank and her family went into hiding from the Nazis in 1942 in a secret annex at the back of a building owned by her father Otto Frank's company in Amsterdam, two years after German troops occupied the Netherlands. Frank chronicled her life from June 1942 to August 1944 when the family was betrayed. Anne and her elder sister Margot were sent first to the Auschwitz-Birkenau death camp in occupied Poland, then in November 1944 to Bergen-Belsen where they died of typhus. A tableau of life for persecuted Jews in Nazi-occupied Europe, Anne's diary was first published in Dutch in 1947 by her father. More than 30 million copies have been sold worldwide. A 1959 Hollywood adaptation of the diary won three Oscars. German authorities announced this week that a 95-year-old former Auschwitz medic who was stationed at the camp when Frank arrived there would go on trial next month on more than 3,600 counts of accessory to murder. The 12-day Berlin film festival will kick off February 11 with a gala screening of Joel and Ethan Coen's send-up of Hollywood's golden age "Hail, Caesar!" starring George Clooney. Meryl Streep will serve as jury president.